2018 was something of a film renaissance for me. This could come down to a few things: a) I restarted my Letterboxd account after three years forgetting about the site, which helped keep me accountable for what I was watching; b) I moved cities and suddenly had triple the access to films (Academy Cinemas in Auckland CBD is a blessing); or c) I started working in film distribution in August, which gave me even more access to (free) films and has taught me a lot about the fact that you really have to see a film in the first weekend because cinemas have to churn through the content quickly (unless you're Bohemian Rhapsody, which after eight weeks is still getting the pick of the plum session times). A bonus reason could be that I'm no longer studying film, so I feel like I can watch a film without thinking about semiotics and hidden meanings and Aristotelean rhetoric. That's bliss. I've gone back to my classic Hollywood roots, I've watched all of the versions of A Star is Born, I've watched two too many trashy Netflix Christmas films...it has been a wildly unpredictable year as to what I liked and what I thought I would like. Weirdly, I've only given one film from 2018 a 5/5 rating (which'll obviously be number one on this list), but there's been plenty of films I wanna scream from the rooftops about. As per, I haven't nearly seen enough (due to my own laziness or the fact that NZ won't get most 2018 films until 2020) but I kinda like this list because it isn't what I expected it to be. Nevertheless, these films deserve a little shoutout! I'll be the first to tell you that I wasn't completely sold with this film as a whole (I wasn't entirely sure about the Doctor's storyline) but I'm not sure that any film rocked me to my core this year the way that this one did. Guadagnino's approach to horror is intoxicating in the way that you absolutely do not want to be intoxicated, and it is glorious. Plus, as my Instagram bio says, 'i just want the best for dakota johnson's career' - this is it, chief. Possibly the most light-hearted film I saw at the film festival, this was the perfect antidote to a cold, rainy winter night. I love Rose Byrne as a comedic actress, and this film is yet another showcase of her talents. While it is quite a simple love story, I loved what the film had to say about mega-fans and how their idols don't necessarily live up to what they want them to be. I can see that I'll be rewatching this charmer a lot in the future. I feel like I don't really need to tell you how good this film is, because you'll already know that. Lynne Ramsay knows her way around a camera and a good story. This is an expertly crafted thriller by way of existential drama, with a strong central performance from unlikely hero Joaquin Phoenix. Was definitely worth the neck ache I got from sitting in the front row of a sold out session! Private Life was unexpectedly unlike anything that I've seen before - a very honest, yet fully fleshed out narrative about a couple's struggle to have a baby. The characters in this film are its greatest asset, as you genuinely believe the situation that they're in because of the way their anxieties are pulled into it. I'm quietly lol'n about the backlash this film is now privy to, but was there a better experience to have at the cinema this year? I don't think so. A ballsy move to make a film that relies on silence in 2018 - yet, I didn't hear a peep out of the audience during the entire film. That's rare. This was the only film I saw more than once in theatres this year. What can I say, your girl loves her romantic comedies with instant-rewatch-appeal, and this film is perfect for that. It is funny, it is dramatic, it made me cry a few times, and Henry Golding is...ugh, I can't with that man. If you need me, I'll be holed up on my couch rewatching this 20 times a month. I only watched this a week ago, but the more time I've had to mull it over, the more I love it - I can envision it being a lot higher in another iteration of this list. It is probably the funniest movie I've seen all year, with vintage Lanthimos staging and a fascinating dynamic between three actresses on the top of their game - Olivia Colman, Rachel Weisz and Emma Stone. The thing I weirdly loved the most was that the men in this film are so secondary to the women, and the film has fun with that. This was one of the most consistently entertaining films I saw this year. It was also a genius approach to retelling a story of people who made some poor decisions, playing with perception and form to make you both revile and root for the guys at the centre of the film. Alexander McQueen had a life plagued with tragedy, which could have easily been sensationalised in a documentary focused on the drama that shaped him. McQueen, instead, uses Alexander's unique fashion designs as the driving force of this film, and weaves the key points of his life into the fabric of the film. What results is a moving, full celebration of a fashion maestro who had an incredible ability to put his life into his art. For some reason, I'm particularly drawn to films about failing marriages, and Wildlife does it exceptionally well. The failing marriage is that of Carey Mulligan and Jake Gyllenhaal's characters, but it is seen entirely through the perspective of their 14 year old son who is old enough to understand, but still naive enough to not fully grasp the rift between his parents. Mulligan absolutely commands this film as a difficult, impulsive woman longing for her youth. It took a hot minute to get this showing in NZ (I bought tickets six weeks in advance for the first screening at the end of November), but it was worth the wait. This film is alive. I couldn't even explain it if I tried, as it is went to some very unexpected places while still possibly being better than I expected it to be (I had high expectations). Also, where can we sign up Lakeith Stanfield to be in everything? This was possibly my most anticipated film for the year, with the original 1937 film being the first film that ever made me cry - I needed a good, emotional film at this point of the year. Despite knowing exactly what was around the corner, A Star is Born still hit those emotional high notes, mostly due to a couple of stellar performances from Bradley Cooper (who I have believed in all these years and he is delivering) and Lady Gaga. Every man and his dog has been hyping this movie up and I'm not about to ignite the Netflix vs. big screen experience debate but this movie. I didn't expect it to absolutely wreck me in the way it did. This is an immersive film in every sense of the world - you become embroiled in Cleo's world, which makes the final act all the more of a rollercoaster. A movie directed by Steve McQueen with a script he co-wrote with Gillian Flynn with a cast like that? I was sold well before the movie even hit theatres. Even though my expectations were high, I didn't expect to spend the final act with my jaw dropped. This is an expertly made, extremely well-performed (FYC Elizabeth Debicki thank you very much), tensely crafted thriller that almost doesn't let up. It's like five movies in one. I was fortunate enough to see Leave No Trace with a sell-out crowd at Auckland's Civic Theatre, followed by a Q&A with Debra Granik and actress Thomasin Harcourt McKenzie. I knew from the moment the film ended that I had just seen the best movie of the year. Granik's commitment to capturing the life of people on the edges of society has never been more eloquent and rich than it is here. This is a film that doesn't offer any easy answers and lets its characters go through the motions, trying to assimilate to a normal life at different paces. Leave No Trace is a striking, complex work of art that truly doesn't get the love it deserves. So what do we think? Any recommendations for films I should catch up on? What films have you been screaming from the rooftops about?! Woo...where to even begin with this. Hello hello, it is me - occasional tweeter, semi-aesthetic film Instagrammer, and self-professed 'former film blogging child prodigy'. I've spent my Sunday afternoon flicking through a few of my posts that I wrote on here before I abandoned it. I'm listening to Lana Del Rey's 'Born to Die' album, which was the soundtrack to everything I wrote from September 2012 until the end of that year - I like to think that was the heyday of my blogging years, where I had so many lofty ambitions for what I could do with my passion for film and when taking a week away from the blog was akin to taking annual leave from an actual job. 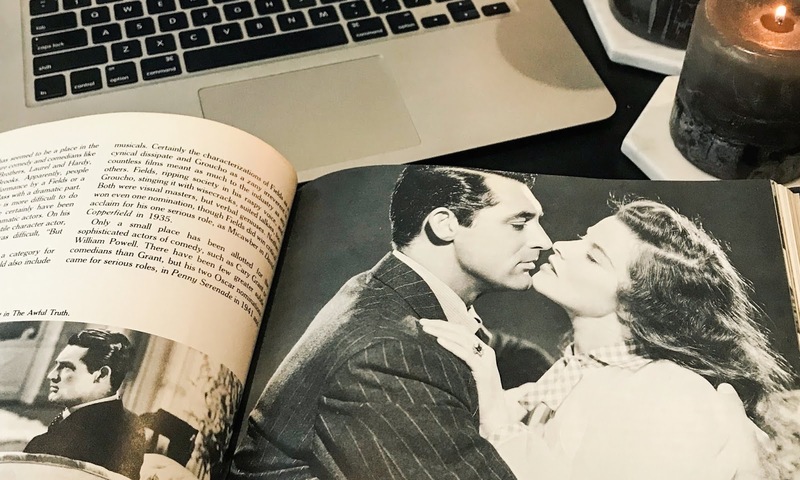 I'm feeling a little sad, a touch mad at myself for giving up on all of this...especially, when I was told in the aforementioned heyday of this blog that I would one day lose my passion for film and writing at some point in my life. Anyone who knows me will know that I'm unusually stubborn - if I get told that my life will go in one direction, I'll do anything in my power to steer it in the other direction. I did, however, lose my passion for film and writing somewhere along the way. And that's why I abandoned all of this. 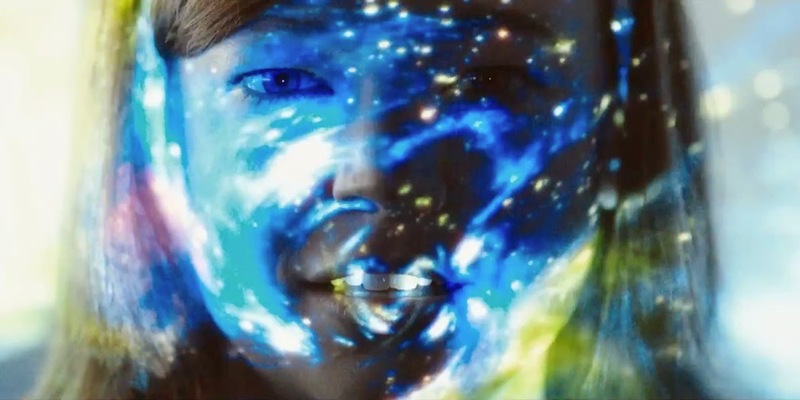 It has been almost four years since I wrote my last post, an unusually strong review of the film Predestination, which features that performance by Sarah Snook that I will always and forever contest as one of the best performances of this decade. In those last four years, I graduated with two degrees in media and communication. I got a scholarship to study for a semester in Finland, which changed my life in the most unexpected ways. I've travelled to over 15 other countries, where I started a new passion: travel, but more specifically, travelling to Sweden. I've become obsessed with high end makeup - when I was last on this blog, I used to only wear poorly colour matched and blended foundation, but now I spend a large chunk of my morning routine blending a smokey eye. I moved 3/4 of the way up the country after I graduated to give myself better job opportunities, but they took a little while to come (more on that later, maybe). On the more serious side, I was diagnosed with a myriad of issues with my reproductive system - mild endometriosis, PCOS and PMDD - which left me grappling with an uncertain future for my fertility when I was only 19. My long ignored mental health issues also became increasingly difficult to deal with. I started having frequent and severe panic attacks when I was 21 (although the anxiety has certainly been there since I was a child, but we just put it down to me being shy and an overthinker). For the past year and a half, I've dealt with some fairly bad bouts of depression - that's something I wish I could explain, but it isn't exactly in the past and there's no simple answer for it. And hey, all of these life changes can be expected. Even if I tried, I couldn't be the same 17 year old girl from a small town with big dreams that I was in 2012. Things became difficult/crazy/strange/different for me - as they do for everyone - and suddenly, I couldn't sit down and write about movies. In fact, I couldn't sit down and let myself write anything that wasn't a university paper for just about four years. I wanted it to be perfect, I wanted to have the hottest take on something, I wanted to understand a film better than anyone else did. But I wasn't capable of that, so I'd stop myself before I even tried to write about XYZ film. And then when I started struggling more with my brain, I could put on a film and absolutely not take anything in. That felt horrible, because it wasn't something I was deciding to do myself - I had no control over it. There was a period of time last year where I became extremely ill, which I'm told was potentially because I was having a nervous breakdown of some kind. In that time, I couldn't go to the cinema without feeling so anxious I was extremely nauseous. Great, I thought. One of my happiest of places was being taken away by the fact that my brain and my body didn't want to play ball. The first film I was able to see in cinema again was The Disaster Artist. I initially felt so nauseous I was about to leave, but the film made me laugh so much, and then made me so hopeful, that for a moment I felt like everything was going to be normal again. In terms of me and my movies, of course. So it has been a little strange to read through some of the stuff I previously wrote and be like 'damn, I was actually a good writer'. I never thought much of what I was doing on this blog while I was doing it. I just enjoyed having a space where I could talk about the things that mattered to me, and people who dug that would be around to push the conversation. I didn't really worry about my writing having a 'point', I was just genuinely happy to be able to share my own connection with certain films. The moment when I became too hard on myself about this little passion project seemed to signify that I had completely lost the part of myself that was dedicated to this site, and it was never going to return. I don't think I ever truly lost that part of myself. It was just buried under a tonne of self-loathing, sadness, illness, finding new things to be passionate about, trying to find myself (which has been very difficult for me to learn that this is an on-going process and not something that can be done by reading a few Tumblr quotes), and, well, life. So, maybe, if I try this out a little more, we can see how it goes. We can see if I can stop stopping myself from doing things just because I think that they aren't the most perfect, hottest takes on something. I've been explaining this site a lot recently for some reason, and I'm always asked why I stopped, and then I'm told that I should get back into it. If only it were that easy, I tell them. Well, I just wrote this waffle in about 45 minutes. The whole 'Born to Die' album has just ended. I know this isn't going to be the thing that everyone wants to read. But it is here, etched on my little speck of the internet that has content that spans for almost nine years. And I'm going to work on that being enough for me. Chances are you haven't seen - or maybe even heard of - Predestination. I'm not entirely sure when its planned release date is for wider markets, nor am I sure why it was released in New Zealand in mid-September, smack bang in the middle of an extreme dry spell at the multiplex. If you want a quick debrief on the film: its touted as a time-travel thriller directed by the Spierig Brothers (who last directed the equally underseen 2010 vampire flick Daybreakers) and stars man of the moment Ethan Hawke and breakout star Sarah Snook. I suggest watching the trailer so it becomes a little clearer as to why this movie is a little different and surprising, as it is the complete opposite to what they're selling. It isn't a new phenomenon to have the trailer ramp up the intensity of the action to draw in the masses, nor is it new to have a trailer totally misrepresent a movie. What happens when a movie is totally unsellable, though? Because that's what Predestination is - something that can't be easily packaged into an appealing marketing ploy. Yes, it's a time travel thriller. But it has more in common with Philomena than Looper. So take that as you will. For a relatively short 90 minute running time, the film spends the first hour explaining the story of someone who isn't Ethan Hawke - even though he is marketed as the main star of the film (again, not unusual for marketing to play up a star who has been around since the 90s, but you'd be surprised about how long it takes for his character to become anything important). Instead, we focus on the 'Unmarried Mother', played by Sarah Snook, who's story takes centre stage in the film and surprisingly isn't about time travel at all. The last half an hour finally gets to the time travel stuff you were wondering about originally, and all of a sudden the film transcends into a Looper-like, spirally thriller that eventuates into something that is a little predictable. You could say that the element of time travel - or just time itself (similar to what Interstellar did) - does gel together both of the different plots/different films and kind of makes it into something that undoes the cynicism the film begins with. It has been a little while since I saw it, but all I can remember saying about the film directly after walking out of the theatre was that it was 'a big ideas film.' Most of them centre around the character of the Unmarried Mother, some of them play with time, along with an element of revenge that is used to propel the plot. You could say that the film punches above its weight in its short running time, but it also manages to feel a lot longer than the 90 minutes. That's not to say that it is boring, it is just so unexpectedly strange. The problem with the film isn't that it was marketed to be something that it wasn't. It certainly isn't that the film is completely unsellable from a marketing point of view. I just think this film is an interesting experiment on audience expectations. Time travel films usually always end up the same - and yes, this film does wind up being the same by the end - and Predestination throws a new element (or character) into the mix brings her centre stage. It probably wouldn't have worked had it not been for the masterful performance by Sarah Snook, who crafts such an intricately multi-faceted character with ease. Looking for that apparently elusive 'well-written female character'? Look no further than this, and be amazed by the stellar work by Snook. It's a performance so other-worldly that it doesn't feel like it belongs in a supposed simple film about time travel. Looking back on it, this highlighted again how I felt about the strangeness of this film. It is so unique, only to fall back into something so predictable. It is so close to being something great before it does a 180-degree flip into the same paradoxical loop of time travel tropes. 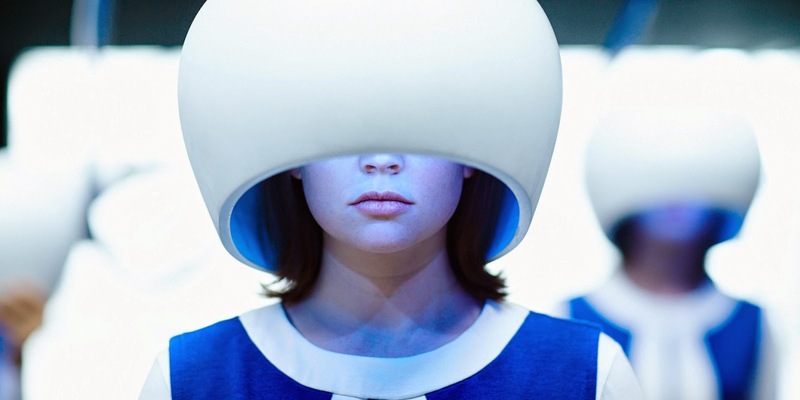 I'd say that Predestination is an interesting experiment in genre-bending. It mostly works. But its willingness to easily fall into normal audience expectations after completely shattering them was a little disappointing. 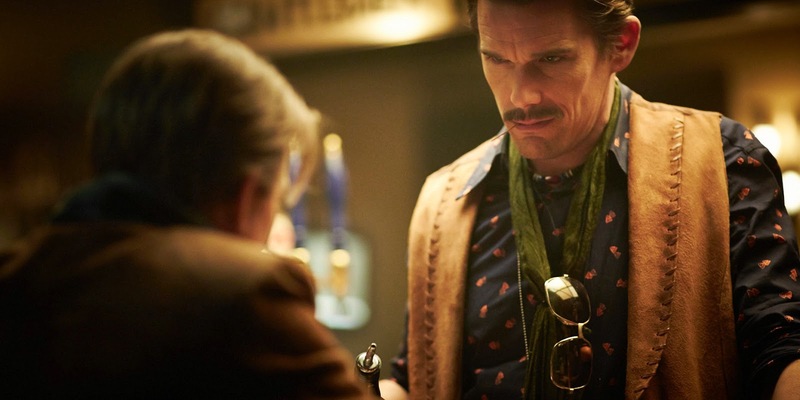 So yes - I'm not exactly sure of how to easily sum up Predestination for an Ethan Hawke fan or someone looking for Looper 2.0 or anyone who wants to see some classic stylish gun-toting. In fact, I'm not sure of how I could sum up Predestination for anyone. Which I guess means that Predestination was pretty successful considering most films these days can be summed up by a simple sentence. Of course, if you've been around these parts for a little while, you'll know that I've been a pretty huge Christopher Nolan fan since 2010. It has reached some pretty fanatical heights (why yes I do own two copies of Memento, a copy of the Inception shooting script and bought a special collectors edition of The Dark Knight Rises that came with little figurines), I may call him God from time to time and I do get exceptionally excited whenever I hear his name mentioned. So of course, once I heard he was doing a film with my favourite person ever Jessica Chastain, along with my other favourites Matthew McConaughey and Anne Hathaway, I was very excited. Levels of excitement included being a countdown for the film from April 6th, using procrastination time to watch the trailers over and over again and possibly just about amputating my boyfriend's hand whenever the trailer came on before the movies we saw at the cinemas. You'd be expecting me to hightail into this movie with the "Nolan is God, he can do know wrong, #Nolanfangirl" attitude. 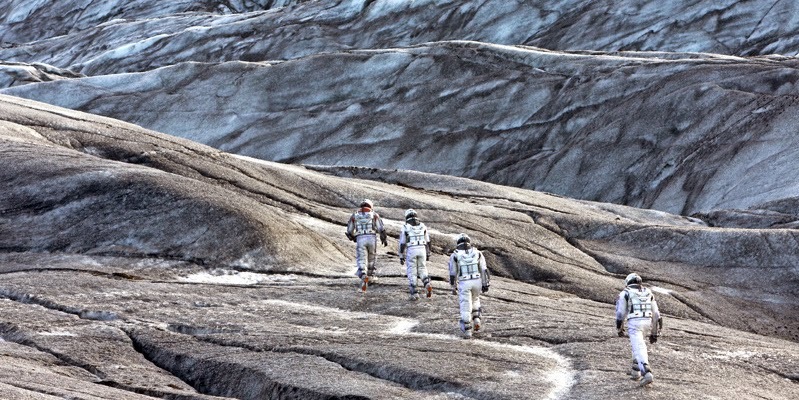 Thing is, Interstellar is not perfect. And that's okay. I have a feeling there'll be a lot of talk about Interstellar over the next few days, so I'll keep this a little brief. I'd have to give this another watch to fully absorb it, particularly in the Xtremescreen format instead of just the normal cinema viewing (damn you, exams). But yes, everything you've heard about the technological achievements of this film are true - this film is probably one of the greatest visual experiences I have ever had. Nolan's new teaming with cinematographer Hoyte van Hoytema (the guy behind the incredible cinematography of Let the Right One In, Tinker Tailor Soldier Spy and Her) has produced some pretty incredible results, giving this film this weird blend of independent sensibilities - think Memento-era Nolan, with the polished pride of something like Inception. The visual effects work on the space scenes, along with the real locations used to represent the other planets are all absolutely perfect. In terms of being compared to Nolan's other work - and of course, I'll have to give it another watch considering I've seen each of his films at least three times, with The Dark Knight being viewed over 25 times - I wouldn't say that this is one of his best. It lacks the completed narrative of Memento (and to be honest, I would take a lot for that film to be topped for me), the general magic of The Dark Knight and the cleanness of Inception. I'd currently place it somewhere in between The Prestige and The Dark Knight Rises if I were ranking his films, but since it is a little too early to tell, here's what I will say: Interstellar is in no way like any of his other films. Yet, in saying that, it isn't like he is departing from the style of anything he's previously done - it just doesn't neatly fit with the rest of his trajectory. Or any cinematic trajectory for that matter. The thing that stands out most about Interstellar is that it shows incomparable ambition that is precisely the reason why I love film so much. Let's just take a second to appreciate how damn ambitious Interstellar is and for that reason alone it should be counted as one of the greats. Every single frame is dripping with ambition. Nolan has brought out everything in full force, and where we think that he'll step back in fear of going too far, he chooses to go further. He goes much further with this film than what is generally 'required' by a film, and maybe that won't be to everyone's taste but I was utterly in awe of what he was doing. The emotional strain of this film is absolutely beautiful, mostly due to the wonderful performances by Matthew McConaughey along with Mackenzie Foy and Jessica Chastain playing Murph at different ages. Apparently the scientific stuff was pretty interesting, but even though I didn't really understand some of it, it was still broken down in such a way that it was easy to swallow. Again, the film isn't perfect - it is hard to pinpoint reasons why, but it is so very close to being a masterpiece. The really fanatical Nolan fanboys will tell you this movie is resoundingly perfect, and they could be right. The really fanatical Nolan haters will tell you that it is overlong and silly, and they could be right too. Even though I've been hyped up for this film for months, I am hesitant to say whether it lived up to my expectations, but I don't think they ever extended beyond me being generally excited to see my favourite actress in a film by my favourite director. It is going to generate some interesting discussion by being a bit divisive - and I think that's something we're lacking a little these days with films either being "good enough", "MASTERPIECE (that we'll inevitably forget about anyway)" or "wow that sucked". Above all, I'm still floored by the ambition and courage of this movie, but it isn't perfect by any means. And you know what? I'm not even disappointed that it wasn't perfect. I'm not even disappointed that it doesn't rank high among Nolan's best. I'm not even disappointed after months of waiting, it didn't completely change my world in a way that some of Nolan's films have. I'm grateful that it reminded me of love these stupid little things called film and want to make a career out of them - Interstellar is direct proof of how much ambition can be put into them. If you really need proof of just how much I was affected by this film, I cried quite profusely four separate times during the film, characteristically cried at the sight of Christopher Nolan's name, then cried for a full fifteen minutes after the film. I'd like to say that I've grown out of Nolan's films emotionally wrecking me, but I haven't.